Marvel Tales - ZineWiki - the history and culture of zines, independent media and the small press. 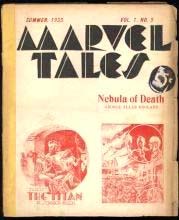 Marvel Tales was a literary fanzine devoted to science fiction and fantasy writing published in the 1930s by William Crawford. William Crawford lived in Everett, Pennsylvania, U.S.A., where he owned his own letterpress and would print his fanzines one page at a time. Marvel Tales were issued with coloured covers and on varying coloured paper stock. The first issue was 40 stapled pages. Crawford was determined to break the stereotypes of science fiction and release work that the professional magazines wouldn't print. Crawford published "The Creator" by Clifford Simak and "The Titan" by P. Schuyler Miller, both stories previously rejected by professional magazines. Other contributors included Robert Bloch, with his first published fiction, "Lillies", Miles J. Breuer, August Derleth, Anders W. Drake, George Allen England, Ralph Milne Farley, John Beynon Harris (John Wyndham), Lovell Hert, Robert E. Howard, Carl Jacobi, David H. Keller, Amelia Reynolds Long, Frank Belknap Long, and Natalie H. Wooley. Most notably, Marvel Tales was the publisher of several H. P. Lovecraft stories, beginning with the very first issue, which appeared in May 1934. As well, William Crawford was the sole publisher of the only book of Lovecraft's work to appear in his lifetime, The Shadow Over Innsmouth. Crawford's editorial decisions shaped the future of science fiction and weird fantasy fiction by championing writers whose work was not yet acceptable to the mainstream, something that was only possible to do in a fanzine. This page was last modified on 2 January 2012, at 00:28.